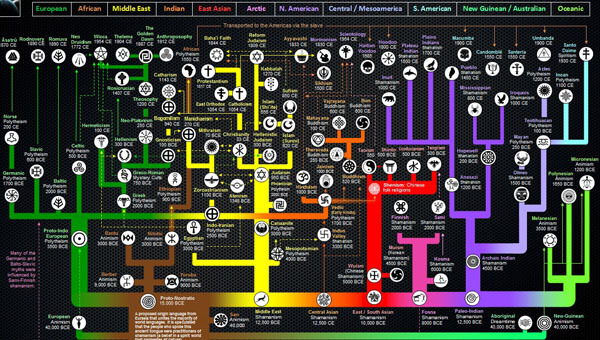 This is a timeline infographic mapping the evolution of various religious lines, organized geographically. 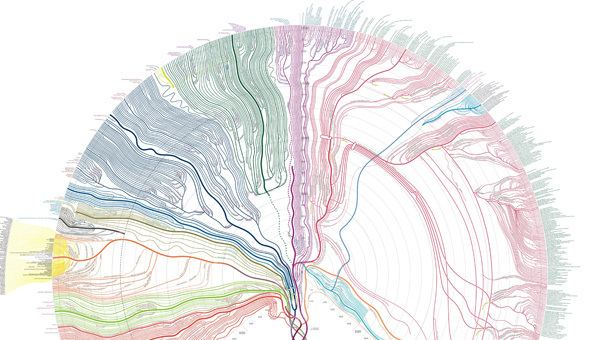 The colour use is great for not losing track of the regions as you read up and down the tree. I also appreciate the effort in putting associated religious symbols next to the names, as a nice and more granular visual element to spruce up the tree nodes (pun intended). I also like global timeline infographics generally, giving me a nice overall picture. My experience with history has always quickly drilled down and rarely given me a sense of the world at once and across time for a given topic. 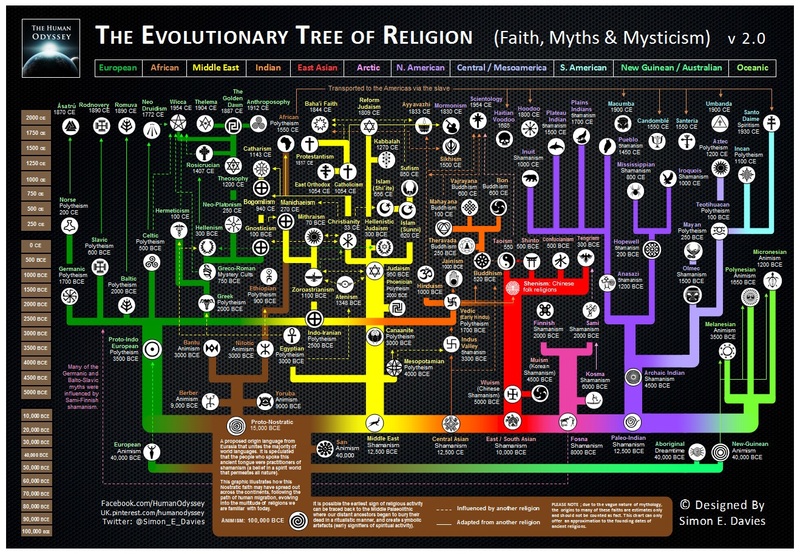 I wonder if someone could pull off a fuller sense of religious evolution (to capture, for example, the extent of the spread of Christianity outside the Middle East) in a heavier infographic, but I think it’s fine to not have it here. 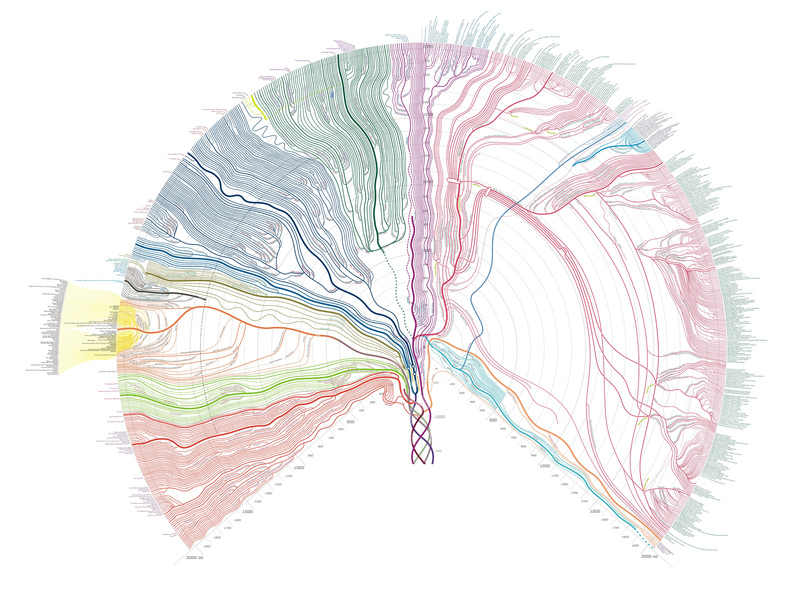 I’m happy to have a mapping of religious origins. The dotted lines to indicate the influence of one religion on another are cool, too, and I think it adds a lot to the amount of education here. The infographic could have been decent without the influence lines, but made all the better for having them. While the visuals are simple, they ended up looking nice. The fonts used are also simple, but they’re ugly. After all the effort that went into this, seeing default fonts like that is disappointing. This entry was posted on November 28, 2014, 10:02 am and is filed under History, Society & Culture. You can follow any responses to this entry through RSS 2.0. You can leave a response, or trackback from your own site. Any chance you could post a higher resolution version of the first graphic? This is really cool.